Students will be able to identify parts of a cell and describe the function of each organelle. The cytoplasm is the jelly substance within the cell membrane that keeps all other organelles in place. Think of Jell-O that has berries inside. The nucleus is the control center of a cell. The nuclear membrane is the security guard for the nucleus. It helps regulate what comes in and out of the cell. The nuclear membrane has a very important job, because the nucleus' job is to maintain DNA, control metabolism, growth and reproduction. Wow! That must be why it is the control center of the cell! Where is the nucleolus located? Rough endoplasmic reticulum produces ___________ that are transported to Golgi body. Ribosomes produce proteins, like Rough endoplasmic reticulum. It can be found within the rough endoplasmic reticulum and all around the cell. Golgi body transports proteins and lipids to other organelles inside the cell. where cellular respiration takes place. considered the powerhouse of the cell. Lysosomes are like the garbage trucks that take away the trash we have at home. These organelles get rid of dead organelles and waste within each cell. 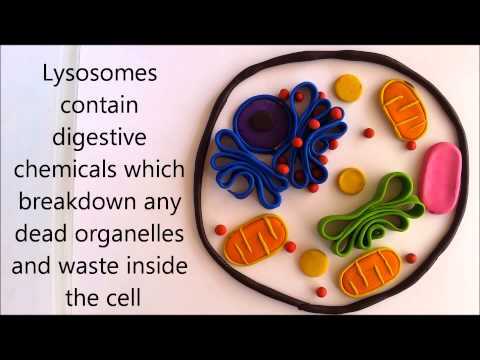 Lysosomes contain digestive chemicals that help them do their job. Animal cells and Plant cells are similar, but very different. If humans were made of plant cells, we may look like very odd trees. Let's see how animal and plant cells are different. the size of the vacuole. the golgi body and ribosomes have a different function. the plant cell has a larger nucleus. the animal cell doesn't have a cell membrane. are the site of photosynthesis. are also inside of the animal cell. The cell wall is another important difference in plant and animal cells. The cell wall gives the plant cell a specific shape. You can see the difference in the pictures below.